If, like Cynthia Heald, your aim in life is Becoming a Woman Who Walks with God, this is the devotional for you! 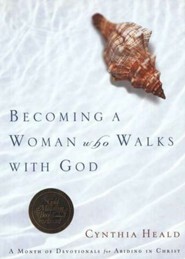 Take a 31-day journey of reflection and discover the joy and importance of communing with God. Each meditation features a Scripture passage, Cynthia's insights, thought-provoking quotes from Christian writers and thinkers, questions to ponder throughout your day, and brief topical prayers. Previously published as Abiding in Christ. 112 pages, softcover, NavPress. 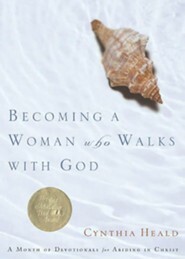 I'm the author/artist and I want to review Becoming a Woman Who Walks with God: A Month of Devotionals for Abiding in Christ - eBook.